Help Your Child Cope With Death Of A Loved One — Melodee Roo & The Wantoks Too! After 40 Years as a psychotherapist, Sharon Diaz created this digital, interactive at-home grief support program making it easier for families to know what to do. It's available anytime, anywhere, to use at your own pace. Apsy is Melodee's friend. Both he and Melodee are learning to cope with the death of their loved one. 'Wantok' means close friend and one who speaks the same language. Melodee Roo & The Wantoks Too! understand all about loss and the language of grief, lending a helping hand to you and your children. Eugene has a habit of suddenly appearing to help Melodee. His favorite saying is, "Feelings Are For Healing". Relatable characters provide step-by-step guidance for a child and family. I hear this all the time...What do I do? What should I say? Now you can learn and have the confidence you are doing and saying the right things. Encourages open communication about death. Simple, clear, concrete explanations are suitable for children. It even answers a question kids have - Does it hurt to die? Helps a child to identify sensations in their body and to name and express emotions that are a normal part of the grieving process. There is a difference between thoughts, sensations and emotions, but EVERYBODY mixes them up. Help your child not to feel mixed-up or discombobulated. Lets a child explore troubling thoughts they may keep to themselves and gives outlets to express them. A communication skill is taught in Roo-Letter Four. Roo-Tivities in each letter guides children to express themselves in different ways. Helps a child understand that courage helps to build resilience and confidence as they learn to cope. Kids are resilient, but they need help in coping and building confidence. The power of friendship with Melodee Roo & The Wantoks Too! softens the wall of isolation a child may feel. Kids won't always talk to their friends because they know they won't understand. Provides coping strategies for nightmares, handling anniversaries, birthdays, and special events, helping to keep memories alive. There are tons of ideas and projects they can do, and the song, In A Different Light is great for helping with nightmares. Children and families alike love Disney songs. There are six songs written by a composer who has written for Disney films. Provides an opportunity for families to bond together as you read each Roo-Letter and do Roo-Tivities together. Only you know how devastating your loss is. Help each other to heal together. Provides year-long guidance that lasts a life-time, because grief does not end after the funeral. Melodee Roo & The Wantoks Too! 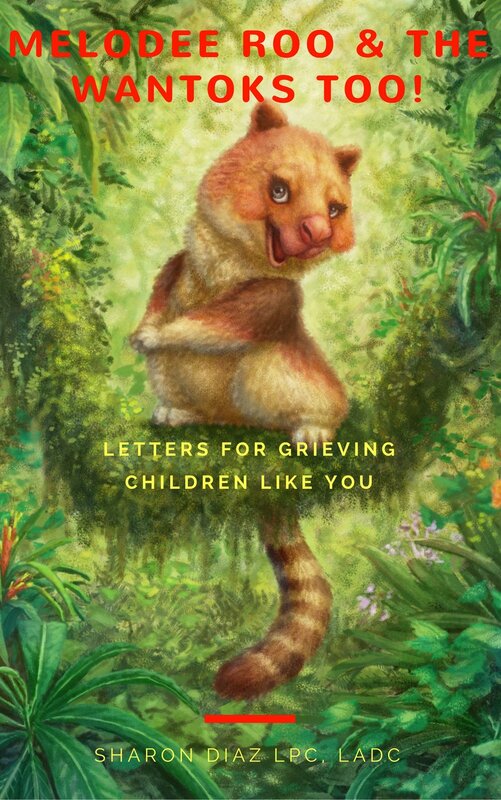 Letters For Grieving Children Like You is the only resource to offer this type of long-term guidance for your family right in your home. Each Roo-Letter focuses on how to cope with one aspect of grief: physical sensations, sadness, anger, worry and negative thoughts, guilt, forgiveness, communication skills, resilence, how to turn pain into power and more.